Joost- our beer specialist behind the bar. Our drink menu is so comprehensive there will surely be something to suit. With approx 400 beers we have one of the most comprehensive beer menus around. We are also proud to say that there is rarely anything out of stock. Pater Lieven blond, La Chouffe, Chimay tripel, Westmalle dubbel and of course our blond house beer Sodalitas are available on tap. 5 other beers are also served on tap each month from traditional to season specials. We have almost no beers from the big breweries, as you can find them anywhere ! We would like you to try the traditional beers from smaller brewers. We have a lot of respect for these firms who make and sell their own products. We have all the trappists beer, and special attention is given to Orval. 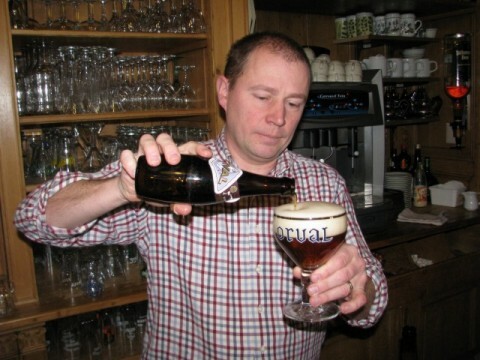 We were the first Flemish to be made Orval ambassadeurs in 2004. Our main speciality however is Lambik. This unique product lies deep in our heart. Geuze is another that we have a wonderful stock of, both vintage and classics. Beer cocktails also feature and are not be laughed at ! !, these are sometimes a wonderful way to sample flavours together. From 2016 we will have a new wine menu focussing on both Belgium wines and Belgians with vinyards abroad. Also Gin from Belgian distillers. Sherry, port and calvados also are very much on the menu here. For our whiskey fans we have over 80 in our current collection.